As fashion designers, it’s easy to get pigeonholed in one category or role. Maybe you’re stuck in denim and want to do lingerie, or a tech designer and are dying to work on the creative side. In this chapter, we’ll go through a few strategies you can use to create opportunities for yourself to break into that new fashion design job. 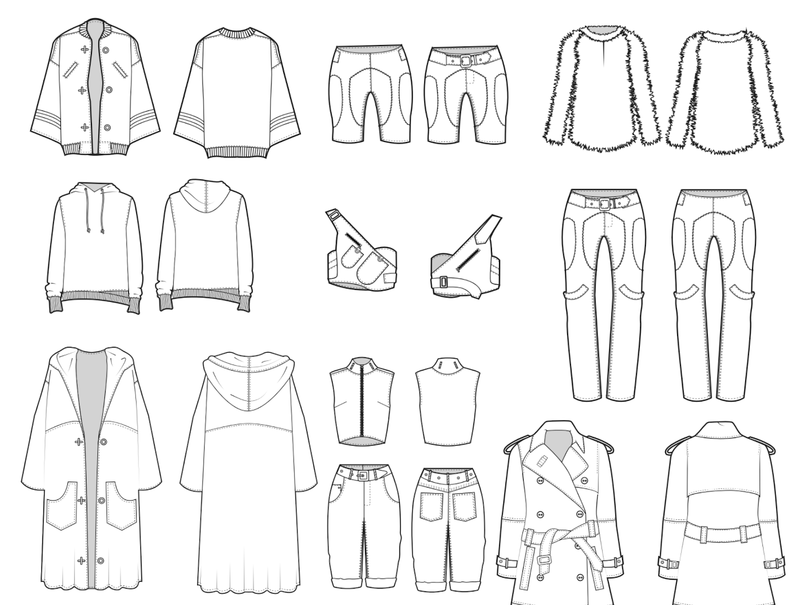 How do you put together your fashion portfolio for a “new to you” category or job in the fashion industry? Listen, I’m not going to sugarcoat it and say you can easily break into a new category. Depending on your determination, who you know, and some luck, this can be really hard. Fashion designers do get pigeonholed, and chances are, if you do get the opportunity to design in a new category? It’s going to be because of a relationship / contact, not because of your fashion portfolio. It’s going to be because you are able to make a lateral change in a company you already work for, rather than finding a new gig in a new category from scratch. The kind of jump you want to make is going to impact your success rate as well. Swim to active is a shorter jump than swim to knit sweaters. Think about the crossover in knowledge about fabrics, construction, trims, finishes, etc. I don’t want to discourage you, but I want to be realistic. On that note, I am a firm believer that you can create opportunities for yourself. But you have to WANT it, and you have to WORK for it. I mean REALLY WANT it and REALLY WORK for it. Your best chances for success probably mean getting yourself into the right network and connecting with the right people to create this opportunity for yourself. From there, you may have to do a test project to show you’re capable. If you’re not putting yourself out there and networking (why aren’t you doing this?! ), then your next best chance for success is SHOWING brands that you understand their aesthetic and know how to design into their category. And that means doing self directed projects for that category. That means you’re finding friends (or people) who have startups in this category and helping with their projects (probably for free or at a reduced rate to help build your fashion portfolio…more on this later). Somehow, you are creating collections to show that you can and want to design into this category. Let me tell you a story about a (soon to be) fashion designer named Jasmine. This is a true story, and it unfolded while I was writing this book. Two days before my publish date, I emailed Jasmine and asked if I could share her story with you. To my absolute delight, she said yes. So, here is the story about a girl with a BIG vision…but NO experience. While she wound up working at a fashion brand in NYC, it was in Ecomm, nothing to do with design. But her dream of working as a designer never died. So she took it upon herself to improve her portfolio and skills, on top of her full time job. 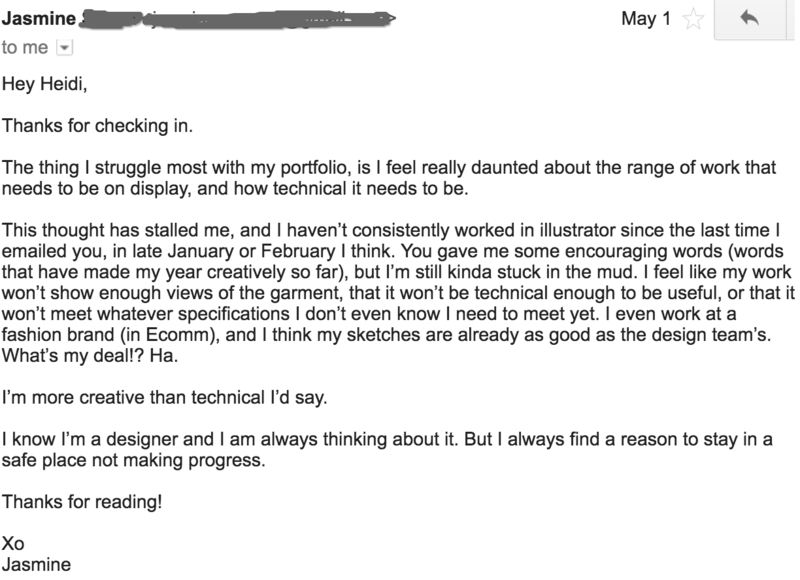 So, she spent weekends and nights improving her Illustrator and tech pack skills. I replied and told her they looked fantastic, and that she was doing great. And then, things fell silent. For a few months, I didn’t hear from Jasmine. Like a lot of you, she had gotten stuck. And it was simply because she found “a reason to stay in a safe place”. So I replied and asked Jasmine if she was up for a call to talk more. We hopped on the phone, talked about her portfolio, and I gave her some advice on next steps. What if there aren’t enough details and close-ups? But she said she would do it. So I gave her a week deadline and told her to get back to me when it was done. To my surprise (because most people I give advice like this too never follow up), I got a wonderful email from Jasmine letting me know she did her homework. Right as she was feeling good…right as she was trying to get amped up for her big meeting on 5/31…she got a big slap of discouragement. And it was because of one of MY podcast episodes. But here’s the thing you have to understand about the fashion industry. There are people out there who are going to tell you you can’t do it. Tell you you’re not good enough. Tell you there’s too much competition. This industry will chew you up and spit you out. It will pick you up only to tear you down. It will crush you at the worst possible time. And you have to keep your foot on that gas pedal and keep going. It will be hard, and there will be times you want to give up, but you have to keep moving forward. I linked to the article once already, but if you didn’t read it yet, I highly suggest you take 2 minutes to check out the 3 Bones Lead to Success Article. She asked for a meeting. And she got it. And then, just when I thought it was happening for Jasmine, things took a turn. She emailed to let me know how the meeting went, and the news was not good. Now, before you make a judgment about what happened, there are a couple important details you should know. Jasmine told me there were layoffs just a week ago, so my guess is that the office climate may be a little off. 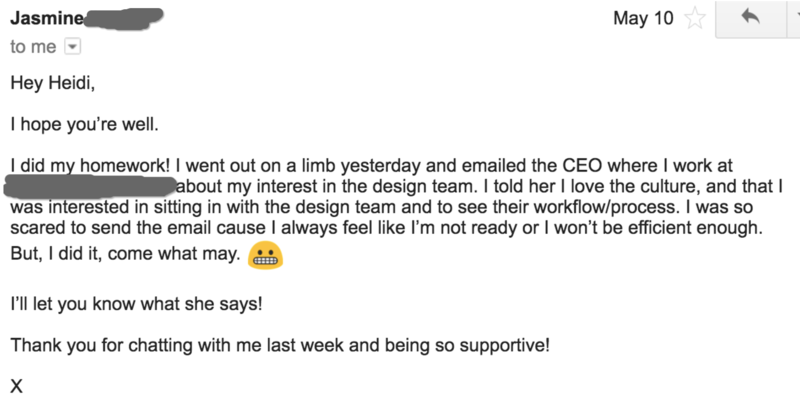 There is only “one designer left on the design team”, and having been in a similar position to that myself, I can imagine she may feel in a blur about what’s going on within the company. So while the meeting didn’t end with any big opportunity, I do think there is still a chance to nurture this relationship in a more casual way. Maybe it means asking the designer out for a drink to share her interest in learning and where she’s coming from. Because you know what? It’s amazing how people will open up when you approach them honestly and explain your situation. It’s amazing how people want to help you when they understand a little more and the protective barrier comes down. Jasmine will have to use her judgment call and do what she feels comfortable with, but there are ways to continually open doors even when it feels like they’ve been softly closed. Creating a relationship with this designer now may not produce an immediate result or opportunity for Jasmine, but it may eventually. Because it is your relationships and friends who will bring you in for an interview at their next job when there’s an opening. It’s how this industry (and most) works. Did you know that hiring good employees is one of the biggest challenges for many companies (in any industry)? It’s actually really difficult to find hard working, reliable staff. I’ve experienced it firsthand, and heard it from others in fashion and beyond. Which I see as is a way bigger deal than she may realize right now. That will actually get you ahead. I told her that the road may be rocky and hilly and there will be times she will fall down (no different than most of us who’ve “made it” in fashion). But with her attitude and determination, she is going to make it in this industry too. Because someone like Jasmine is the kind of person who brands want, even though she didn’t go to fashion school. Someone like Jasmine is the kind of person brands are willing to take a risk on, even though she doesn’t have any experience. Your fashion portfolio or website is not a “build it and they will come” thing. Yes, you need a body of work to share, and most of the time, that comes in the form of a portfolio. But you need to put yourself out there, build those relationships and create those opportunities. You have to do the leg work and get out of your comfort zone to make this stuff happen. It is only after you do that, that it may start to feel like things “magically” fall in your lap like I know they will for Jasmine. And you’re right, she does. But she also has hurdles to get over. No industry experience (not even an internship). No portfolio with any “real life” work. All the leverage she has to find an opportunity? She’s creating it herself. Listen, each of you has your own version of a “leg up” and your own version of “hurdles” to get over. Stop making excuses. Stop with the “buts” and the “what if’s”. Use the advice in this book, apply it to your own situation, and take action. On that note, let’s dive back into the original topic for this chapter to see what it is you’re supposed to be taking action on. How do you put together a fashion portfolio for a “new to you” role or category? Well, like Jasmine did, you somehow create a body of work. 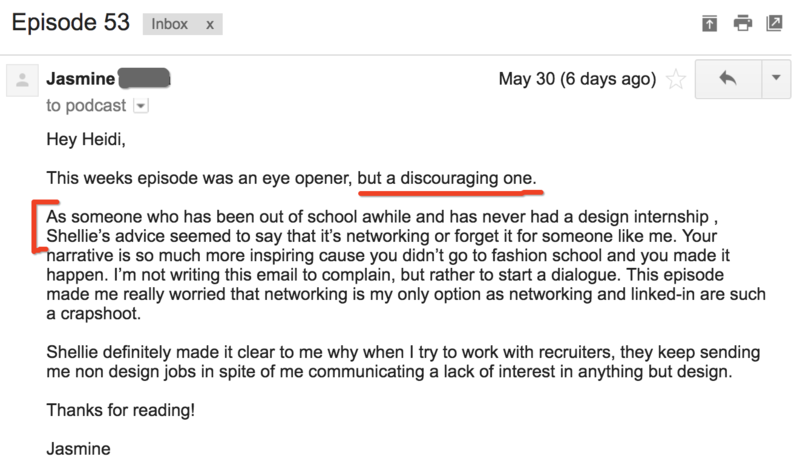 Self directed, for a friend’s startup, for your own fashion brand, doesn’t matter. I’ll tell you now that there are no rules. Two or so small capsule collections or one larger assortment should be a good starting point. And I’ll remind you, if while reading this, your first thought is, “but Heidi, I am too busy with my [full time job / family / life / insert your excuse here] to do a self directed project on the side!! !“, then it’s probably not for you. Like Jasmine, this should be all you think about. If you want it badly enough, the work should be a no brainer. The desire to make this happen should be so much an extension of your being that you just have to do it. You will somehow manage to find the time, even if that means staying up until 2am or waking up early before your day job starts. If you’re not, you need to reevaluate what you really should – or want to – be doing. Now, it’s major disclaimer time. All this said, it’s still going to be hard. Chances of approaching a recruiter to help you find opportunities in new categories? TOUGH. I know because they told me this (and it almost crippled Jasmine). Chances of landing a job on StyleCareers with no resume experience in the new category and just self directed work? SLIM. Chances of finding an opportunity in a “new to you” industry through relationships and some good ol’ fashioned networking? YOUR BEST BET (like Jasmine is working on!). 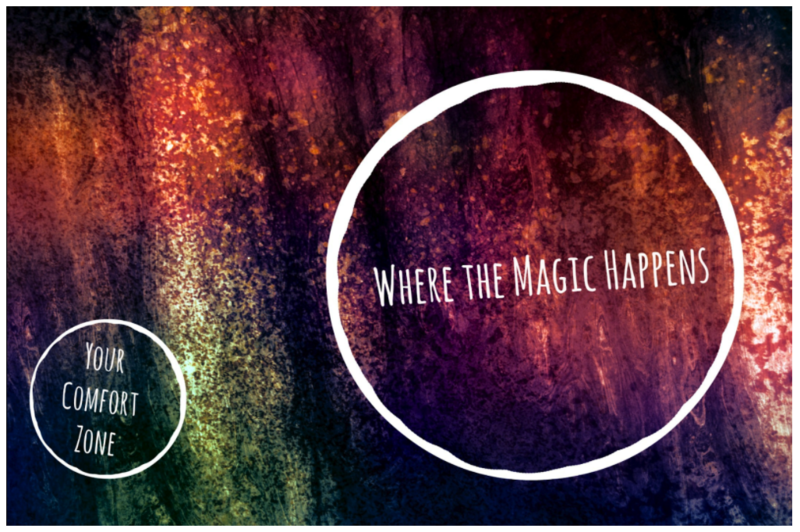 Your best opportunities will be discovered amongst your network, your contacts, and getting yourself out there. I know those are really vague instructions, but this is what you have to do. It means talking to people you know in the industry and tell them what you’re working on. It means going to events / mixers / meetups and having conversations. In case you haven’t guessed it, you’ll show you’re capable by creating a collection that adheres to the Portfolio Golden Rule, just like Jasmine did. On top of that, if the jump between categories is big, focus on showing you know fabrics and construction for that new category. This may mean some extra education on your side (google, asking friends, even reaching out to someone blindly on LinkedIn to see if you can get some help) to learn this stuff. One of the biggest barriers a brand may have in hiring someone new to a category is the steep learning curve. They may not have time to train you, so if you can show that you’re up to speed and willing to put in the extra effort (on your own time) to learn, you’ll put them at ease. That said, you don’t have to know it all (I mean honestly, we don’t ever know it all, even after working in a category for years), but showing you have a base understanding and knowledge will give you a huge head start. And again, if you “can’t find the time” or just aren’t willing to put in the effort? Then I hate to say it, but you probably don’t want it badly enough to make it happen. Now, if a random opportunity falls into your lap and you’re not prepared with anything to show, there are some “tricks” you can use. If the opportunity is a last minute call for a full time or temp job, it’s best to go into a meeting with something, even if it’s just a few rough sketches you did the night before to show your ideas. If it’s for a true, remote freelance opportunity (not a “temp job”), the scenario may be different. Either way, think about how you can get creative when you present your work. Let’s say you landed a meeting for women’s active but don’t have any direct experience. How can you combine experience from other projects (or even your life) to show you’re capable? “I don’t have any one project that falls directly into women’s active, but let me explain why I know I can do a great job for you. 1. I’ve done swim before, and am knowledgeable about performance fabrics and construction. The learning curve will be quick and I am willing to put in any extra time outside of my duties to get up to speed. 2. I’ve worked in the industry for X years and fully understand the entire design process. I know from industry friends that there’s not a huge difference amongst most categories. 3. And last? I am the target market! I’m an active [yogi / runner / whatever you are] and honestly, I live and breathe this stuff. I see it at the gym almost daily, and I’m always up on the trends and what people are wearing. Your examples may look different than this. Maybe you actually aren’t the target customer. That’s ok! This is just an idea. It’s up to you to get creative on how you can implement it. And last? I know you don’t want to hear it, but I’ll emphasize it again, because it is SO important. Your network and contacts are the number one resource you have. In all my years of freelancing, I never landed a new gig in a new category because of my portfolio or self-directed projects. It was all through networks and contacts or because I created and asked for an opportunity. Golf turned into running, yoga, and high performance outerwear, and even an opportunity to design women’s underwear. I never had any of this work in my fashion portfolio, but good contacts and referrals got my foot in the door.